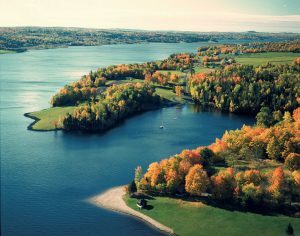 Eastern Canada is a region which has so much to offer the tourist and we aim to provide you with the best information so that you can plan the trip of a lifetime. The provinces located in this part of the country include Ontario, Quebec, Prince Edward Island, Nova Scotia, New Brunswick and Newfoundland and Labrador and we can guide you through each one. All of these provinces are packed with tourist attractions and beautiful stretches of countryside and beaches, so there is something for visitors of all ages. Cities such as Halifax, Toronto and Quebec are perfect if you enjoy museums, nightlife and shopping, and you should not miss out on a trip to the country’s capital of Ottawa, where the Parliament Buildings attract hundreds of thousands of tourists each year. Find out more as you explore our website. The cities of the region are a great blend of traditional and modern and the varied history of each part of the area is clear to see from the architecture. The diverse culture in the region also helps to make this part of the world unique. There are clear signs of the region’s French heritage, and there will be opportunities for you to practice speaking French, particularly in cities such as Montreal and Quebec, where many residents use it as their first language. Another option for a trip to Eastern Canada is to explore the region known as the Maritimes. This label covers the areas of New Brunswick, Prince Edward Island and Nova Scotia. With plenty of coastline, islands and rugged countryside, it is a great area to get up close to nature and scenery, and away from the hustle and bustle of city life. There are several national parks here so you can be sure that these areas are protected and have avoided excessive development. Check out our pages on these provinces to find out more. We don’t just provide you with information about tourist attractions though. We aim to arm you with all the data that you need to ensure that every aspect of your trip is taken into consideration – even the weather! Canada is beautiful all year round, but some seasons are better for travelling in than others. Check out our guides to the regions and the top attractions and soon you could be enjoying the holiday of a lifetime in this amazing part of the world.